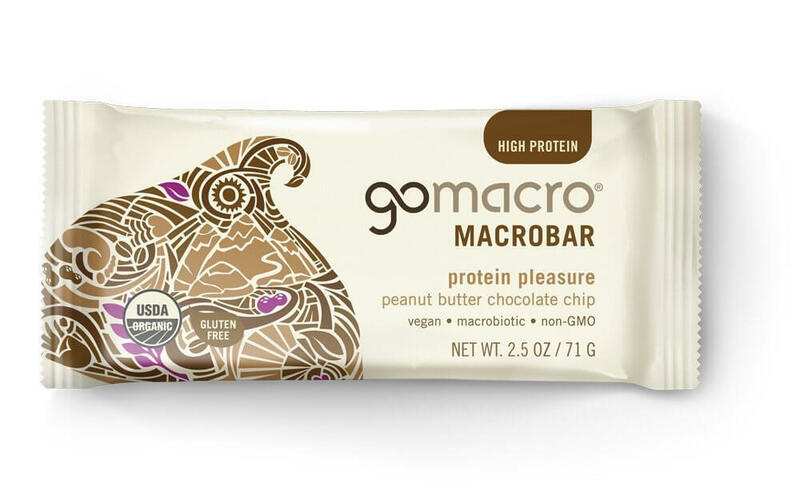 The GoMacro bar is vegan friendly and easy to find. It’s an organic bar with “simple” ingredients. I’ve found it at a local health store, along with Whole Foods. Many online stores also carry it. So, in my quest to find the best vegan protein bar, I tested out the GoMacro bar. All bars are rated in 3 categories to make them easy to compare. This review is divided into those categories: nutrition, taste, and cost. The ingredients and amount of protein in each bar varies a bit based on the flavor you get. I believe the highest is the peanut butter chocolate chip bar, but unfortunately I couldn’t find that flavor. Instead, I tested the banana and almond butter bars. Only 40 calories out of 270 come from protein, which is one of the lowest levels of protein I saw of any bar. That works out to 14.8% of all calories. I created a simple formula that scaled the protein content percentage to a score out of 10 to be fair to all bars. Here it spits out a score of 4 out of 10. Organic Brown Rice Syrup, Organic Peanut Butter, Organic Brown Rice Protein, Organic Fair Trade Chocolate Chips (Organic Evaporated Cane Juice, Organic Chocolate Liquor, Organic Cocoa Butter, Organic Soy Lecithin, Organic Natural Vanilla), Organic Peanuts, Organic Puffed Brown Rice. Obviously all organic and clearer fair trade so you can 100% sure that everything is vegan and ethically obtained. The ingredients are indeed simple, you could make these at home if you were willing to put in the effort. A low protein content can be made up for by tasting really good, so let’s see if GoMacro bars redeem themselves during the taste test. This was the stickiest bar I’ve reviewed so far. You can see in the picture above that pulling it apart warped the 2 pieces. What I found surprising was while it looks and feels a lot like squished or blended dates, there actually aren’t any in the ingredients. Very firm and chewy bar. The flavor isn’t terrible, but it’s far from good. Overall, it’s edible without too much struggle, but far from enjoyable. As far as taste goes, this bar is the definition of mediocre to me. Despite having syrup as the main ingredient, it someone still doesn’t taste good. So overall, it gets a taste score of 5 out of 10. The nice thing about these bars is that you can buy them individually in local stores before committing to buying any boxes. But if you do buy a box, the price per bar comes out to around $2.7 per bar on most days, but keep in mind that you’re only getting 10 grams per bar. Again, I have a simple formula to spit out a fair score based on the price per 10 grams of protein. In this case, GoMacro bars get a price score of 3/10. Even though the bars are cheap, you’d have to buy/eat multiple of them to reach most protein goals. Add up those individual scores and you get a 12/30 overall. That’s one of the lowest overall scores of any of the vegan protein bars I’ve tested. Think of it like a school grade, a 40% is a fail. Safe to say, I’m not a huge fan, and there are many other bars out there that I think are better for vegans.